There's no nicer card than a hand-made or hand-coloured card, and whoever is lucky enough to receive one of these is sure to treasure it! We've got colouring cards for all the major holidays of the year. Simply print them out onto good quality printer paper or printer card, colour them in and fold once. With a variety of designs we hope we've got something here for all ages of children. Autumn Colouring Cards - NEW! Pirate Colouring Cards - NEW! Playing in huge piles of crunchy leaves is one the most fun activities in autumn! Delight someone by colouring in this lovely card and giving it to them for a birthday or any other occasion. Here's a lovely simple autumn tree colouring card that's ideal for younger kids to colour in and give to someone special. Colouring cards are the perfect way to show that you've made some effort for someone by carefully colouring in a picture just for them! This colouring card features a lovely woodland scene with three badgers. We've chosen a bold font for this card but otherwise left it simple so that your child can decorate the rest of it with their own pictures and patterns. How about filling in the background with stripes in Dad's favourite colours? Colour in the letters on this "best Daddy " colouring card, then decorate the borders and background however you wish. Simple but fun and effective! Let your child's teacher know that they are the "best teacher" with this fun colouring card! There is a very intricate design on this pretty Bhai Dooj card for one sibling to give to another during the Diwali celebrations. This Bhai Dooj card shows a sister bringing Diwali food to her brother, while he presents her with a Bhai Dooj gift. It's a slightly simpler version than our Bhai Dooj colouring card 1, so perhaps easier for younger children to colour. Get the kids to colour in this simple card of a newly married "Mr and Mrs" - a fun way to give the wedding couple something special! Our budgies scene card is perfect if you're looking for a card that's a bit different, and because you're colouring it in yourself it will be truly unique! If you are celebrating Canada Day why not colour and send this fun Canada Day celebrations colouring card. It would make an excellent invitation for schools or groups to use for children to invite their families to join in the celebrations. Here is a pretty card for you to print out for the kids to colour in, featuring the carnation in "nature study" style. This catching butterflies colouring card feels full of the joys of summer making it perfect for a summer birthday. This catching leaves colouring card really captures the joys of autumn, making it perfect for an autumn birthday. This caterpillars scene colouring card could be used as a thank you card or birthday card - but also for Mother's Day or Father's Day. Just print, colour and fold. 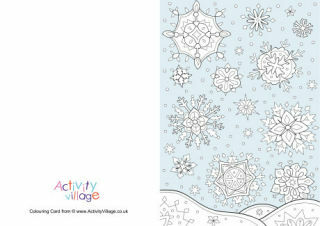 Here is another one of our more simple Christmas colouring cards, ideal as a colouring activity for the younger kids. This one features a pretty Christmas bauble. This colour pop card featuring a boy holding a Christmas present looks great to start with, but it'll look even better once the kids have coloured in his picture set against the Christmas background! This fun Christmas classroom scene is perfect for older children to colour in and give at Christmas time - perhaps to a favourite teacher? It might also make a lovely Christmas activity to hand out in the classroom. Here's a pretty scene of two children getting ready for that special Christmas Eve bed time, for the children to colour in and give as a card this Christmas. We've got a lovely nativity scene Christmas card ready for you to print and colour in. Just choose from our larger card which folds into A5 size, or our smaller card which folds to A6. This simple Christmas present colouring card is perfect for younger children - just print onto some card, colour in the picture using nice bright colours then fold in half. Some of you will remember this lovely Christmas room scene from one of our early online Advent Calendars! Now the kids can colour it in for a really special Christmas greetings card to give. Homemade cards are always well received, and this simple Christmas Stocking colouring card can be easily coloured in by hand by kids of all ages. Here's a pretty Christmas colouring card featuring a beautiful European street-scene at Christmas for kids to colour in and give! This Christmas tree colouring card has a lovely simple design, so younger kids can enjoy colouring it in too. They could always add a little bit of glitter too for a bit of extra Christmas sparkle. Whoever receives this Christmas village colouring card will really appreciate the effort a child has made to colour it in by hand, and will truly treasure it! The dahlias on this pretty colouring card drawn in "nature study" style and are perfect for older children to colour in. Print with borderless settings if possible and then fold in half. 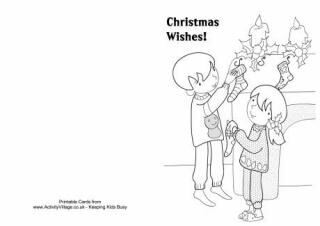 Here's a fun Christmas colouring card that younger children will enjoy colouring in and giving to someone special! Children decorate a pretty Christmas tree and the card wishes a Merry Christmas! Dolphins are so popular! Maybe it's their friendly nature, or the amazing things they can do? Kids can colour this beautifully illustrated card which shows two dolphins frolicking in the ocean. Anyone would be delighted to receive it! Colour in this cute little basket of eggs and chicks to make a sweet Easter card. The children are enjoying playing with bunnies at Easter! Just colour in the picture then print and fold in half to make a cute Easter card. The Easter bunny is coming! Print and colour this fun Easter card on A4 paper or card, then fold in half. The kids are dressing up for Easter! Colour them in, fold in half, and give this cute Easter card to someone who will appreciate it. Here's a simple Easter colouring card to print for kids to colour in the classroom or home. There are lots of pretty Easter eggs with all sorts of patterns for the kids to colour on this Easter card - as well as a cheeky Easter bunny (or two). One little girl is enjoying an Easter egg hunt! Colour in the picture and fold in half for a really cute Easter colouring card. The Easter bunny is painting a beautiful Easter egg in this fun Easter colouring card for children. Just print, colour and fold. Colour in this lovely Eid picture, fold in half, and you have a extra-special Eid card to give to friends or family. Wish friends and family Eid Mubarak with this printable colouring card. A beautiful Islamic mosque is the subject of this colouring card wishing Eid Mubarak. Enjoy colouring in this lovely 'Faith' word colouring card, then pass it to someone you love so they can enjoy looking at it! Print our Father's Day colouring card out onto white card or good quality paper. Get the kids to colour in the picture and fold in half, then write their message inside. This fish scene colouring card would be a lovely thank you for someone who has looked after your aquarium while you were on holiday. What better way to share the 4th of July celebrations than with a colouring card featuring Fourth of July celebrations. You will get the best results if you print this card borderless. This 4th of July fireworks colouring card would be a lovely way to thank a party host. Colour this lovely Fourth of July fireworks colouring card as an invitation or a thank you or simply to mark the celebrations. Get out the red, white and blue crayons, this patriotic Fourth of July colouring card is sure to be treasured by the recipiant. Our fourth of July picnic card would make a fun activity at the picnic for children to make as a keepsake. They could colour the card and have all the people at the picnic sign inside. This fun 4th of July sparklers card would make a unique invitation to an Indepence Day party. Here is another of our "nature study" colouring cards, this one of a pretty foxglove. Colour in our cheerful frogs on their lily pads, then fold in half for a lovely greetings card that would suit many different occasions. When someone is feeling unwell and staying in bed, I'm sure a lovely card like this wishing them "get well soon!" would be appreciated! Let someone know you hope they get better soon with this cute colouring card. A bit of effort put into the card can make all the difference to how someone is feeling! Someone's hurt their leg! Wish them a quick recovery by colouring in this fun card - it's sure to cheer them up. Cheer up a little boy who is feeling poorly and confined to his bed by getting the kids to colour in this cute "get well soon" colouring card. This pretty card is sure to cheer up a sick friend or mum, especially if coloured in nicely. Children can colour in this card to wish friends who have broken their legs a speedy recovery! Kids could colour in this lovely "mother and baby" giraffe" colouring page specially for Mother's Day - but it's too nice to save just for Mother's Day! Use your printer's borderless settings and fold in half. Print, fold and colour this pretty gladiolus colouring card, in "nature study" style for older kids. For the 4th of July or any national holiday or as a gift for friends taking a trip abroad, this God Bless America card would make a lovely keepsake. Guinea pigs are a popular pet animal, and the kids can colour this beautifully illustrated card which shows two lovely guinea pigs eating some snacks. Anyone would be delighted to receive it! Delight a friend by colouring and sending them this cute hamster scene colouring card. Here's a nice idea for a birthday card - a special design which the kids can colour in themselves! Print onto good paper or printer card, and fold once. Wish some one special a Happy Canada Day by colouring this fun Happy Canada Day colouring card for them. Mark Canada Day by sending this simple and bold Happy Canada Day colouring card. Print this lovely Easter card for the kids to colour in. It's a very Happy Easter design! Here's a pretty colouring card to wish a Happy Eid! Children can colour in this lovely design to give to Dad on Father's Day - something really special! This card prints best with your printer's borderless settings turned on. Print this fun Grandparents' Day colouring card out onto good quality paper or printer card, then fold in half. Get the kids to colour it in and send it on its way! This simple Happy Grandparents' Day colouring card allows the kids to get creative with colour – especially when colouring in the pretty border and letters. Just print out and fold in half. Print our Happy Nowruz colouring card onto good paper or card, then colour and fold in half. All ready for the New Year celebrations! This Year of the Monkey colouring card will make an extra special greetings card for someone this Chinese New Year if it is coloured in by a favourite child! Just print into good quality paper or card and fold in half. Say it loud and clear with this simple colouring card! Children can add thei rown border to the card, add pictures or a design to the background. Do you know someone who loves big cats? Give them a lovely surprise by colouring and sending this jaguars scene card. Here's a really fun colouring card for the kids to colour for a newly married couple. Who can resist a "Just Married" sign and balloons on a car! Bring this card to life by colouring in the kite and the rainbow, then fold in half and give to someone special. How many of us were taught by our grandmothers to knit, crochet or sew, I wonder! I certainly was! 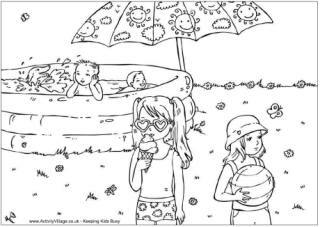 Just print this colouring card onto good quality paper or print a card, fold in half, and have a go at colouring in the scene. Granny is sure to appreciate it. Get the kids to colour in this pretty sprig of lavender for someone special! Just fold the card in half when you are done and you have an extra special greetings card to give. This Lily colouring card would be perfect for a summer birthday, perhaps Mother's Day. It might also work well as a condolence card, and the receiver is sure to appreciate the effort put in to colour in the flowers. This lovely lion scene colouring card would make a perfect printable for children to give their daddy on Father's Day, or for his birthday, or to colour for any animal lovers. One of these lizards is about to catch himself a tasty snack! Print onto some card, colour in the lovely picture then fold in half for an extra special lizard greetings card! When you want a special card for the kids to give, when print out this "lots of love" teddy card. There's a little bit of colouring involved – enough to make the card special without intimidating younger children. Cute isn't a word you normally associate with manatees but I think applies to this lovely picture of an adult and child. One for children to colour for an adult who cares for them perhaps? Make someone's day by colouring in this fun meerkats scene for them! Print using borderless settings for best results, then simply colour and fold in half. This pretty Christmas colouring card wishes you a Merry Christmas with festive lettering - fun for kids to colour and give, and sure to be appreciated by whoever receives it! Here are eight mini Valentine cards for the kids to colour, cut and fold. They would be fun to hand out in the classroom - or also perhaps for the dolls and teddies this Valentine's Day? This lovely family of owls needs to be coloured in carefully, folded, and given to someone who will appreciate them! It makes a super colouring card for older children. Use your printer's borderless settings for best results. Colouring cards make a lovely homemade surprise to send to someone you care about - and this one is perfect if they like penguins! Here's a lovely idea for a birthday card - a fabulous pirate design which kids can colour in themselves! Simply print onto a piece of card then fold. Everyone loves to receive a card with a personal touch. Kids can colour in this pirate ship card themselves - simply print onto some card, fold, then colour! Batten down the hatches! Here's a colouring card of a pirate ship on some choppy seas, perfect for older kids to colour in and give as a greetings card. Simply print onto some card (preferably using your printer's borderless settings for the best results) and fold. Homemade cards are always a lovely surprise! This card has a fun pirate-themed picture for the kids to colour in. Print onto some card, colour in, then fold. Here is another of our "nature study" colouring cards, this time featuring the lovely poppy! Did you know that each robin has a unique breast pattern? You can give each of the cute robins on this colouring card a unique red breast, then give the card to someone special. How many Dads out there think they are rock stars - or would like to be one? Here's the colouring card for them! It prints best using your printer's bordeless settings. Another in our flower nature study set, this pretty rose colouring card would be perfect for a summer birthday perhaps as a thank you card. Colouring cards are always extra special to receive, and even younger children can have a go at colouring this fun Santa Claus. Kids can colour in the scarecrow on this lovely colouring card and give it to someone special...perfect for Autumn perhaps? This sea lions scene colouring card is perfect for a child to colour for an older sibling, a parent or grandparent, or perhaps an older friend. Here's a fun card for the kids to colour and give to a special friend or family member, featuring two grinning sea turtles under the ocean! This sweet Valentine's Day scene - of two little girls posting their valentine cards - makes a cute card for kids to colour and give. Here is a set of four pretty little Valentines for the kids to colour, fold and give - perfect for the classroom. Another set of four little Valentine colouring cards - perfect for younger children to print, colour, cut out, fold and give! Who wouldn't enjoy receiving a space colouring card? Use it for birthdays, special occasions or just to send a message. The picture is lovely with lots of detail, and if the kids colour it in caerfully before they give it, it is sure to be appreciated even more. Wish someone a happy St Andrew's Day by colouring in this lovely card to give to them. Can the children colour in the Scottish flag correctly? St Andrew was said to have a simple belief that we should share what we have with those less fortunate and be kind to each other. You can show someone some kindness on St Andrew's day by giving them this lovely hand coloured card. This fun St Andrew's day colouring card already has the background filled in with the colours of the Scottish flag, so the children just need to colour in the rest of the design to make a stunning greeting's card! Print using borderless printer settings for the best results. This clever St Andrew's Day colour pop colouring card uses the Scottish flag as a background, so the rest of the design will really pop out of the page once it's coloured in! For best results, try printing using the borderless settings on your printer. Colour in this pretty stained glass window picture before folding in half to make a really special greetings card. Why not send someone special this summer doodle colouring card to share your enjoyment of the season of sunny days and warmer weather? There is so much detail on this summer nature doodle colouring card that it will take quite some time to colour. Any lucky recipient will treasure it. This sunflower colouring card is designed for older children, being something like a nature study drawing. Colour, fold, and give. The lovely big sunflower on the front of this printable card is perfect for younger children to colour in. You could even cut a photo into a circular shape and stick it into the centre of the sunflower. This beautiful colouring card features a scene with a lovely family of swans - the babies are very cute indeed! We think anyone would be delighted to receive it! Here's a colouring card for Teacher Appreciation Day - or any time you want to give your teacher an extra-special card. Here is a fun card to give to friends or family, coloured in by the kids first, of course. Perfect for a Scot? This beautiful colouring card featuring two tigers is quite detailed. Children can take their time colouring in the picture, which makes it extra special for the lucky person receiving the card! Kids can colour in the tiger scene on this adorable colouring card and give it to someone special for a birthday or any other occasion! Colour in this lovely picture - a scene of Santa's toy factory - for an extra special Christmas card for your child to give this festive season. Print and fold once. Here's a nice idea for a pirate-themed birthday card - a special treasure chest design which the kids can colour in themselves! Ahoy there! Here's a colouring challenge that's great for older kids. Can the children carefully colour in this detailed treasure map? Print this lovely "Trees are Special" colouring card for the kids to colour in for friends or family who love trees and nature. Here's a cute little Valentine angel to colour, fold and give. Get the kids to colour in the pretty wedding cake on this colouring card, then fold in half and write a message on the inside. This simple colouring card won't take long to print and colour, but that doesn't mean that it won't be appreciated by the "just married" couple! Here's a colouring card featuring a mother wolf and two cute wolf cubs - fun for kids who like the outdoors, or perhaps for cub scouts? How many little boys have spent time in the workroom or shed with their grandfather, making things and sorting out piles of nails and screws? It may not be as common now as it used to be, but this lovely scene is fun for the kids to colour in and it makes a lovely card for a crafty grandpa. Our beautiful Chinese dragon design on a colouring card - just print, fold and give. Here's a lovable dragon colouring card for Year of the Dragon - Happy New Year! Colour in this card for Year of the Dragon and wish friends and family a Happy Chinese New Year! Here's a fun project for the kids this Chinese New Year 2015. Colour in this Year of the Goat card - preferably in lovely bright colours! Then fold and give to someone special. Colour in this Year of the Horse colouring card carefully and it is sure to be treasured by the recipient! Best printed with "borderless" settings. Perhaps you could use some traditional Chinese New Year colours for this colouring card (red is perhaps the most popular), and of course, you can colour the cute pigs with pink! Colour in this card to wish someone a Happy Chinese New Year or make a special gift for someone born in the Year of the Rooster. Colour in this beautiful Year of the Snake card for Chinese New Year 2013. Just print, colour and fold! Just print and fold this Year of the Tiger colouring card, then colour in with cheerful and appropriate colours for Chinese New Year. It will next be Year of the Tiger in 2022. Do you have a zebra fan in the family? Why not colour them this zebras scene colouring card as a surprise.